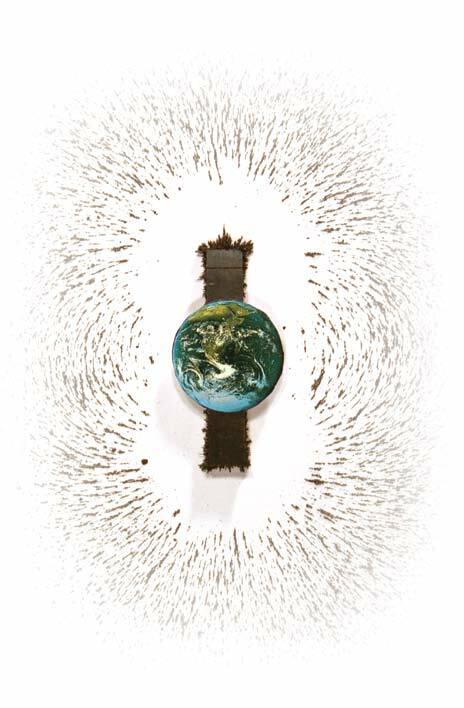 The Earth produces a magnetic field similar to that produced by a bar magnet, as illustrated in this model using iron filings. The iron filings align themselves along the lines of magnetic force generated by the magnet. Many people buy topographic maps to aid in backcountry navigation, but some do not know what to make of the rather cryptic information regarding magnetic declination. If it is printed in the map margin, it must be important. But what exactly is magnetic declination? To understand magnetic declination, it helps to first consider Earth’s magnetism. Molten iron circulating within the Earth’s hot outer core generates electrical currents, which in turn generate a magnetic field similar to that of a giant bar magnet. 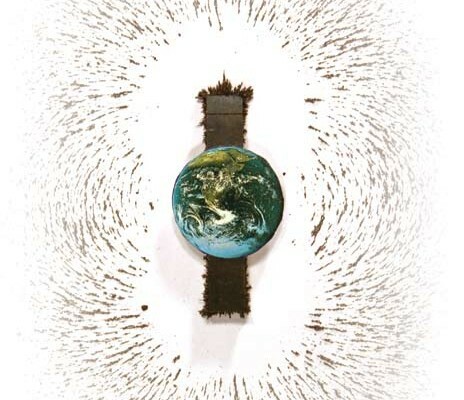 The magnetic field arises in Earth’s interior and extends over the surface, into the atmosphere, and far into space. The Earth’s magnetic field serves a number of useful and interesting purposes, such as protecting the Earth from incoming solar wind particles, generating the spectacular polar auroral light displays, and assisting many animal species in global navigation (for example, sea turtles, honeybees, whales and dolphins, tuna and salmon, pigeons, sparrows and robins). The magnetic field is also important because it determines what direction a compass needle will point—the needle aligns with lines of magnetic force at the Earth’s surface, lines that converge at the magnetic poles. The Earth’s magnetic and geographic poles are in different places, and magnetic declination is the angular difference between the direction a compass needle points and the direction to the geographic North Pole. For most of the populated world, this angle is between zero and 30 degrees. Currently, Salt Lake City has a magnetic declination of about 12.5 degrees east (in other words, true north is 12.5 degrees west of the direction a compass needle points), but the angle has been getting smaller over time. The geographic North and South Poles, located at 90° latitude, are stationary and coincide with the axis of Earth’s daily rotation. Conversely, the magnetic poles migrate over time. 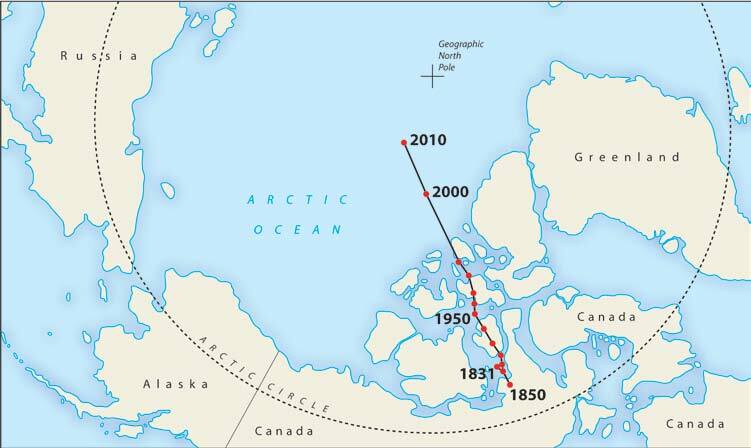 First located in 1831, the North Magnetic Pole has since moved hundreds of miles closer to the geographic North Pole. The North Magnetic Pole wobbles every day in an elliptical path as much as 50 miles across, and it continuously drifts about 2–30 miles or more per year, occasionally changing direction. The rate of movement also changes. Over the past three decades the North Magnetic Pole’s rate of movement has greatly increased (the South Magnetic Pole, just off Antarctica, has moved sluggishly by comparison). 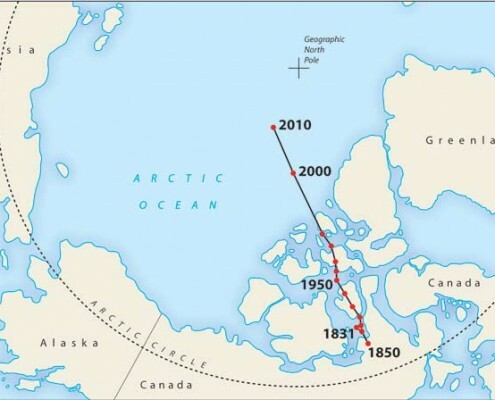 For a century the North Magnetic Pole has moved northwest over northern Canada—it has accelerated, deserted Canada, and is trekking across the Arctic Ocean toward Siberia. By 2018 it is expected to pass within 250 miles of the geographic North Pole. A wandering magnetic pole corresponds to a changing magnetic declination for any particular location. The change of the magnetic declination was first recognized nearly four centuries ago when discrepancies were noticed in compass readings over time at the same location. For Salt Lake City, declination is currently decreasing at a rate of about 7 minutes of a degree per year. Besides updating declination maps, magnetic field changes bring about such actions as the occasional renumbering and repainting of airport runways, which are characteristically named based on magnetic heading. Knowing the current magnetic declination of your position allows you to determine compass bearings from a map that match what the actual bearings are in the real world. This is critical for crosscountry navigation from point A to point B.
Declination is included in the explanatory information of U.S. Geological Survey (USGS) topographic quadrangle maps and maps intended for navigational or wilderness use. On USGS maps, the declination diagram shows geographic north as a vertical line with a five-pointed star (H) at the top. The direction of magnetic north is indicated by a line at an angle to the right (here in Utah) with an arrowhead and is marked “MN.” The diagram includes the size of the angle between geographic north and magnetic north in degrees, or mils, or typically both. 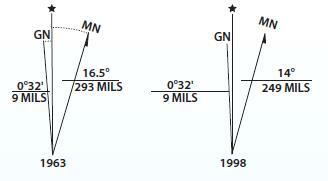 Unrelated to declination, USGS maps also include a third line (yes, a third north!) on the diagram marked “GN” or grid north, which refers to the Universal Transverse Mercator (UTM) grid. For more information on the UTM grid see USGS Fact Sheet 077-01 at http://erg.usgs.gov/isb/pubs/factsheets/fs07701.html. The present magnetic declination can be computed for any location by using an online tool of the National Geophysical Data Center, a division of the National Oceanic and Atmospheric Administration (NOAA), at http://www.ngdc.noaa.gov/seg/geomag/jsp/ Declination.jsp. Enter latitude and longitude, or zip code, and the current magnetic declination for any location, as well as the rate of change, is calculated.